A few months back, CYMBACAVUM made a mention about the EK Japan TU-HP01 portable hybrid tube amp that made its debut at the 2013 Fujiya Spring Headphone Festival. EK Japan, also known as EleKit Japan, is an established electronics maker specializing in miscellaneous DIY kits for electronics and various completed products, as well. 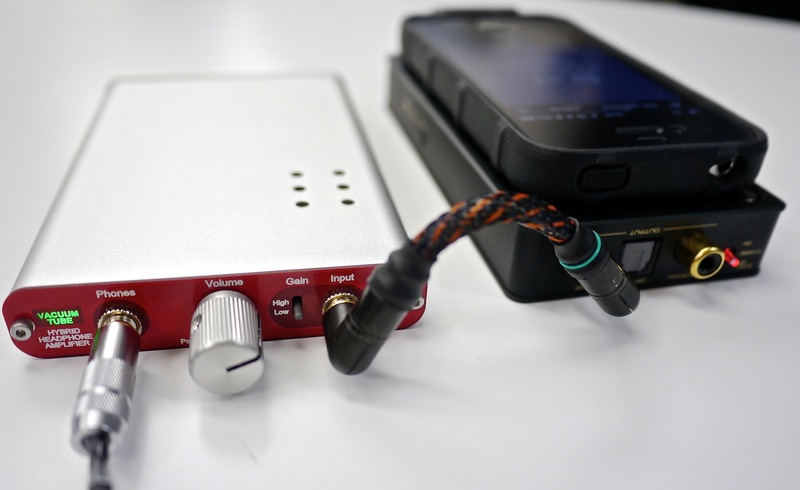 The TU-HP01 is their latest offering to the popular, yet niche portable tube amp market. The TU-HP01 connected to the HiFiMAN HM-901 and outputting to the Fitear MH335DW. 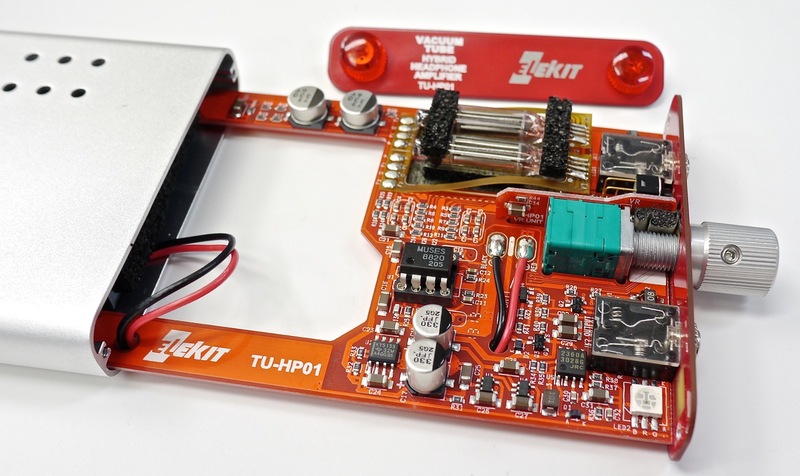 What’s in the TU-HP01 kit? This hybrid tube amp comes with the MUSES 8820 (installed by default, socketable) and Burr Brown OPA2604, along with 2× Raytheon 6418 tubes. As the opamp is field-replaceable, I opted to use the MUSES02 in my TU-HP01 — which is what this review will be based on. An extra face plate is also included in the kit should the owner prefer to switch it “upside down” and have the input jack on the left and the headphone out on the right instead. Unlike other portable tube amps, the TU-HP01 rather slim, yet wide and long measuring at 78mm × 117mm × 16mm. The thumbscrews in the back make it easy to swap 2× AAA batteries without the need for tools. The batteries last for approximately 10 hours and rechargeable NiMH AAA are also acceptable. The overall weight excluding the batteries is a rather light 125 grams. Although the housing is ported, the Raytheon 6418 tubes don’t generate much heat at all and operations aren’t affected even when the ported ventilation holes are covered. The volume dial acts as an on/off switch with the low/high gain switch adjacent to it. The TU-HP01 runs off 2x AAA batteries, which are not included. The Raytheon 6418 vacuum tubes deliver just what one would expect from an introductory tube amp setup — a smooth, natural, analogue-sounding signature. Despite being a low-cost portable hybrid tube amp, the TU-HP01 and its sonics are not to be scorned at. It makes for a perfect introduction to the tube sound without a hefty investment. The Raytheon 6418 vacuum tubes deliver just what one would expect from an introductory tube amp setup — a smooth, natural, analogue-sounding signature. Overall, the amp seems more midrange- and treble-focused in its frequency signature. The bass, despite being somewhat more neutral, has a nice reverberating quality that is enticing and pleasant to the ears. However, depending on the earphone/headphone pairing, the midrange and the treble are more the strengths of the amp to my ears. Especially with warm & bassy earphones such as the FitEar MH335DW or TO GO! 334, the midrange and treble extend nicely, giving a more tonally-balanced presentation. The midrange retains intimacy, especially with jazz vocals. Similarly, the treble extends smoothly and quite evenly without any noticeable spikes. Once properly warmed up the trebles are quite airy. The dimensional sound staging of the TU-HP01 is surprisingly impressive in terms of width, depth, and height. This could be possibly due to the MUSES02 opamp installed in my unit, but it definitely performs rather competitively with some of the more expensive portable amps. In this area, the head room and the depth imaging catch my attention somewhat more than the soundstage width; however, that’s not to say the soundstage is narrow — if anything, it’s probably more average, but with stronger focus on depth imaging and headroom. Despite being a hybrid tube amp, it doesn’t let you forget that there is a tube component to it. The smoothness and the analogue-esque presentation is quite apparent. As I’m realizing with tube amps of any size, dampening of vibration is important. Smaller portable tube amps seem to be more susceptible to vibration than bigger (and more heavily stable) tube amps. With the TU-HP01, assuming that the headphone is already inserted, the plugging and unplugging of an interconnect, or the click from the volume dial off/on switch result in a high-pitched ringing sound that takes a few seconds to dissipate. Moving the amp during operation yields the same symptoms. Although it’s not a critically big issue, it can be a little distracting. TU-HP01 connected to the Venture Craft Typhoon. This portable amplifier is ¥19,500 (approximately $199 USD), and at that price it’s hard to fault it, considering the sound it delivers. Granted it’s not suited for every kind of earphone or headphone, and in my collection, I enjoy it most with the FitEar TO GO! 334 and MH335DW. It also does well with the Ultrasone Signature DJ and KEF M500. Within my collection, the only earphone I feel it possesses the least synergy with is the Ocharaku Kaede due to the lack of bass emphasis. I’m constantly comparing it to the likes of the ALO Rx MK3 or the Analog Squared Paper TUR-06, and although those amps still may have a slight edge over the TU-HP01, one may question if that improvement is worth three times the cost. At the very least, the EK TU-HP01 is a great amp to try tubes on before deciding on further investment on the more expensive offerings in the market. I’m a technologist by profession and have been an audio enthusiast for over 13 years — only more recently have I come out to become more active in the audio community. I very much enjoy reviewing, writing, and sharing my impressions with fellow enthusiasts.